In 2012, APQC conducted a Best Practices Study to understand how best-practice organizations achieved financial management excellence. 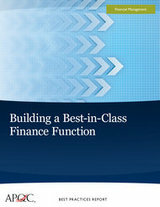 This article provides an introduction to the research, including a list of 14 best practices for or building a best-in-class finance function. Click here to view the full Best Practices Report.